Unidentified indignant radio host, San Francisco, April 1980. Inflamed caller and smooth politician replying, both unidentified. Radio call-in show, New York City, July 1979. Dunya Yusin, Lebanese mountain singer. (From ‘The Human Voice in the World of Islam’, Tangent Records TGS 131). Reverend Paul Morton, broadcast sermon, New Orleans, June 1980. Unidentified exorcist, New York City, September, 1980. Algerian Muslims chanting the Qu’ran. (Same source as 3). The Moving Star Hall Singers, Sea Islands, Georgia (from ‘The Moving Star Hall Singers’ Folkways FS 3841). Unidentified radio evangelist, San Francisco, April 1980. Hey, everybody! I made it back. Didn’t drink too much scotch (mixed it up with a little gin, a Fitzgerald cocktail, to be exact). Anyway, you may have noticed a bit more information up there than is the usual. That’s because this album is a bit different from most (rock, at least) records. All of the vocal sounds (I dare not say vocals) are sampled from various sources. At the time of its release, this was a radical move and, in retrospect, was a pioneering one. This makes for an interesting contrast to my Flipper review, where the lyrics were on the spot. My Life has no real lyrics to speak of. In fact, nearly half of the songs (Regiment, Qu’ran, The Carrier, and A Secret Life) are in Arabic1. Some that are in English (Mea Culpa in particular) are so heavily edited and modified, that they may as well be in a foreign language. But, this is a record where the voices are part of the music, rather than cutting through it or floating above it. The spoken parts add to the mix of instruments (and quite a mix it was, Help Me Somebody featured 14 different instruments allotted their own tracks in the mix) and sustain or even lead the rhythm of the tracks. A little background on this particular grouping/project might be in order (for those of you philistines who don’t know this stuff). Talking Heads (of which David Byrne was the singer/guitarist/songwriter) had by 1980 developed a strong working relationship with Ambient musician and producer (ambient or active, I’m unaware) Brian Eno. Under Eno’s watchful gaze Talking Heads would craft some of their strongest (by many estimates, mine included) albums: More Songs About Buildings and Food, Fear of Music, and Remain in Light. 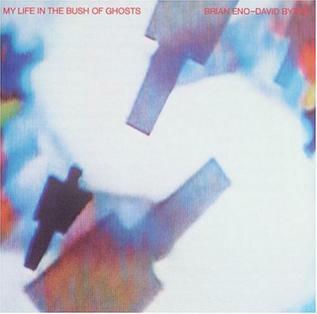 In collaborating on this album at this particular time in either of their careers, My Life in the Bush of Ghosts successfully melds the African beats and unusual instrumental selection of Talking Heads with Brian Eno’s trancy and textural, rather than strictly melodic, work. The songs are not necessarily divided into strict sections of verse, chorus, middle eight and so forth. The structures are droning and repetitive, eliciting a sense of tribal chanting and drumming, more than Western pop music. Perhaps the most representative of this chanting quality (to my ears, and I’m the reviewer, so I get to make those calls) is the track Qu’ran2. The track samples Muslims chanting the (you guessed it) Qu’ran set to a rollicking rhythmic backing with synths carrying a buzzing melody almost in the background. The droning rhythms and jagged synth backing combined with the almost mechanical vocal sounds leave the listener alternately feeling lulled and having the urge to move to the persistent beats. As Eno stated was the nature of Ambient music, the listener can tune in and groove, or leave the music as a pleasant background noise, completely ignoring it. I imagine listeners around a fire, coming and going as they please, tending to their business, while Byrne and Eno beat out these strange sounds from electronic djembes, talking drums, and keberoes. Don’t get me wrong, there are a few ‘normal’ (whatever that means) songs on the album. The most notable being Help Me Somebody, which David Byrne actually plays live. Interestingly, I saw him in 2009, where he made mention of the fact that literally singing the words was somewhat strange, due to the fact that they were originally sampled. Unlike many of the other tracks, the words in this one are in English and readily understood, functioning almost like lyrics. In addition to that, the song follows slightly more closely to a traditional pop song format, featuring lyrical and instrumental sections that could conceivably be thought of as verses, choruses, and even a middle eight (or bridge, for you uncultured folks out there). Unlike my last review, I won’t go in depth on all of the tracks of the album. In many ways it doesn’t readily lend itself to that in the same way that other, song focused albums do. Instead, the best way to take this album in is as a whole, rather than eleven parts. The ambient melodies, droning rhythms, chanted and manipulated vocal sounds, and insistent, tribal beats all mesh together to create something that is much more than the sum of its parts. In hindsight, writing about the album is also an exercise in futility. The music itself is frequently without (discernible) words itself, so how could words convey the feeling in the music? Rather than reading and writing about the music, it should be set in the background, played around a bonfire, embers and ashes wafting through the air, as a storyteller regales the audience (maybe they are intently listening to the music, maybe to the storyteller; perhaps they are staring into the fire in a world of their own), and the gathered group comes, goes, and shifts about as the rhythms play in droning loop, lulling everyone into a sense of calm or urging them to dance. So, what are you waiting for? Go listen to the damned album, already! 1. Perhaps someone who is a native Arabic speaker may find these tracks to have lyrics of sorts. Though, the comments I’ve seen indicate that various Arabic speaking friends who’ve been asked about the album refer to it as “Devil music”. So maybe they just sound like Judas Priest to them. 2. For better or worse, Qu’ran was deleted from later pressings of the album and substituted with the track Very Very Hungry by request of the Islamic Council of Great Britain because of the previous selection’s use of Qu’ranic chanting samples. Don’t get too worked up though, Eno and Byrne complied willingly. In their own words, they were trying to make good music, not piss people off. Okay, this is the last album before I’m stuck covering, gulp, the Beach Boys. Followed by the Beatles. Curse you, alphabet. When I talked about the Alan Parsons Project’s I Robot, I mentioned the stack of doubled records (not double records, though there were some of those, too) that my dad had lying around for me to pilfer. Most of them were unknowns, with a few standout examples. There was a clutter of disco and disco singles (from Casablanca, the label that later held Kiss) from a friend of his–and a bunch of other albums that, my understandings of that friend’s taste suggest also came from him. I tried going through them sort of carefully, using AllMusicGuide as a sort of starting point to determine whether I should bother with a record. There were too many–and I no longer lived at home–to listen one by one, so I wanted a quick and dirty way of getting through the stack. AMG rated this particular album 4½/5 stars, so I decided that was cause enough to drop it in my pile of takeaways. I may or may not have had a recommendation from my father on it as well (if so, he may chime in to that effect in the comments–or to correct that notion). 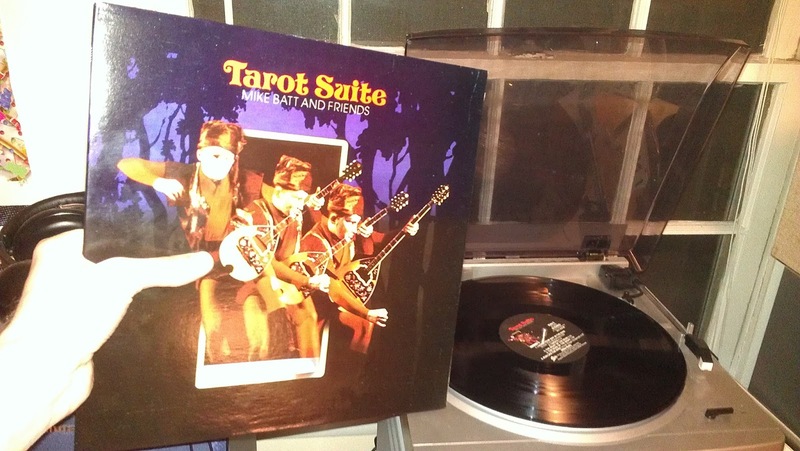 As with many of those records (such as I Robot, and others that come later in the alphabet), Tarot Suite was left to languish, familiar or excitingly new records taking precedent, and eventually getting lost in the shuffle (all told, I have somewhere in the vicinity of 3-400 records). As I listened today, I felt that I might have given it a moment when I first picked it up–just a single spin, though, and one that never really processed. I don’t know quite what I thought of it then (though I can guess), and I’m not sure what I expected when I dropped the needle today. The opening instrumental, “Introduction (The Journey of a Fool)” starts with the just-off bells that make me think of the television show Tales from the Darkside (oh dear–if that reference means nothing to you, this may be an impenetrable discussion, eventually, though I ask that you try to bear with me: sometimes I simply can’t frame a sound or feeling better than a semi-obscure association), a sort of dark gonging that seems to kind of turn down in an uneasy way. Strings from the London Symphony Orchestra immediately make themselves known and add great drama, while a steady thudding heartbeat seems to operate outside the music. Woodwinds bring a more relaxing melody to the party, but wind up to the entrance of the song’s real kickstart: the heartbeat becomes distinct bass kicks and the strings swirl with melodrama, until Rory Gallagher’s guitar punches in and wails the song into the completion of its sound. Batt himself tosses in strange keyboard noises primarily, the orchestra carrying the piece without breaking a sweat. But this isn’t an orchestral piece–not exactly. Control is taken by Batt with a bassy keyboard line that, matched with the choked rhythm section reminds of 70s cop show (or movie) music. Mel Collins (yes–the one from King Crimson) blasts out a brief tenor sax solo, and then Rory Gallagher is allowed to really bring the song home with another guitar solo, but one that is left to the alternating woodwind sections that isolate in pitches and eventually converge to hold the madness at a final note–one that fades to the rhythmic sounds of passing time. Representing The Fool and the Magician, “Imbecile” is one of the more rock-oriented songs. Chugging guitars establish this at the outset, and then the constant quivering of Roger Chapman takes us roughly–there’s also a gravel to it, a powerful one–into the first vocal section of the album, though Batt backs him up on the chorus. The chorus also allows the strings of the LSO to reclaim their place from the guitars briefly, and even open the gates for an ending set of punctuation from the whole orchestra, in full dramatic display. The Magician and The Fool argue over who is the real imbecile, trading philosophies and outlooks on life to a driving beat. It’s actually quite catchy, with a really great vocal from Chapman, that rings bells deep in the back of my head–perhaps it’s some of the artists from The Phantom of the Paradise? If so, I can’t think of which–nor why that association is drawn. I also think of Steinman-backed Meat Loaf, though the LSO is a more expert, precise kind of backing than they ever used. The deliberately flat woodwinds, too, are a bit too eccentric for those sprawling–but ever-poppy–songs. As the album progresses just as Batt writes (in the numerical order of the major arcana), “Plainsong” represents the High Priestess, the Empress, The Emperor, and the Pope. It makes for an odd track in the whole of the album, as the LSO does not appear at all, and only percussionists accompany Batt on a vaguely atmospheric, semi-regal keyboard-driven track. Of course–it’s also built from layered vocals that are also the responsibility of Batt, which, chopped as they are, create a slightly jarring effect (as this technique often does). The primary melody he plays, though, is rapid and dramatic. The only “hit” the album saw was “Lady of the Dawn”, interesting as it is the one track on which Batt has lead vocal. It represents “The Lovers”–one of two tracks that represents only one card. It’s pastoral, and runs the risk of saccharine syrupyness in its initial string melody, but Batt’s voice and the melody he uses keep it just out of this and in territory bridging it and the arty, symphonic sound of the album as a whole–likely also a testament to the skill of the LSO. It’s a concession to the notion of romance in general–mystification at love, eyes opened, world in colour kinds of feelings stemming from the lady of the dawn, whom our singer tells, “I like you for your body, but I love you ’cause you’re wise.” It’s perhaps the gentlest, least varied of the songs on the album, which probably explains its hit status. “Imbecile” and “Run Like the Wind” may be just a bit too bombastic. “The Valley of the Swords” (The Chariot, Justice) ends the first side’s alternation of instrumental and vocal tracks, leaving us with a final instrumental. Batt’s sleeve notes describe The Chariot as “Represent[ing] conquest, either mental or physical. Motion, achievement. The young Charioteer rides confidently and triumphantly.” This is perhaps the most engaging of the generally orchestral pieces: it has a theme that shifts between sections of the orchestra, and even allows another lead guitar moment from Ricky Hitchcock. The technique is familiar: a subtle, hushed form of the melody gives way to a repetition with the entire orchestra behind it. It’s not a bad technique, indeed, it remains quite effective. There is a definite movement to the song–it sounds like the kind of scoring that would back a triumphant, confident montage of travel (in other words, Batt made clear his interpretation when he described The Chariot). The inclusion of Batt’s own keyboards in that style of low-end, softened honking gives the piece just enough quirk to keep it interesting and unusual. As I suggested, a second track represents only one card, and that is “Losing Your Way in the Rain”, bookending Side Two (alongside “Run Like the Wind”) as a vocal track around three instrumentals. The heavy bass and cello (eventually full string) opening leaves us with the bright hints of upcoming positivity that the higher end of a woodwind section often hint at in scores. And then we hear a voice that I’ve got to say is a pleasant surprise: Colin Blunstone, of the Zombies. Blunstone has always had a lovely voice anyway, but this is a very pretty performance from him, embellished in just the right way by Batt’s backing on the repetition of the title. It’s the sound of the Fool finding himself the Hermit, at a turning point in life, with wisdom now under his belt. “Tarota” brings us Batt’s version of The Wheel of Fortune and Strength, credited to four lead guitarists in order of appearance: Jim Cregan, Rony McPhee, Rory Gallagher, B.J. Cole, and sometime one-hit-wonder, longtime session wunderkind, Chris Spedding. The leads are talented, but they are the fill between the peaks of horn-driven moments. Each brings a different style to their performance, which is quite interesting to hear, as the rest of the song moves into Batt’s vocal layering, peculiar percussion and other odd sounds to break the guitars apart. The first of a pair of mirrored songs, “The Night of the Dead” is the most condensed of the pieces: it represents The Hanged Man, Death, Temperance, The Devil, and The Tower. It’s the most seat-clutching drama, cymbal-splashing, stomping, encroaching, varied and tumultuous piece–which, of course, makes sense. It has a lot of ideas and thoughts wandering through it–turning points, hedonism, sudden change, balance, and reversal. It’s almost undetected when it shifts into “The Dead of the Night”, The Star and The Moon, even though that following piece is actually much quieter, a hummingi of tense, pacing strings that holds aloft a lone, deliberate woodwind piece–it’s also Mike Batt’s only abstention from performance. “Run Like the Wind” is the Sun, the Judgment (Resurrection) and The World: it’s resolution, triumph, self-assured nodding at future pans, and it is the return of Roger Chapman’s quaver. It’s bright and sunny, and Mel Collins’s wild sax solo only helps to emphasize that our Fool has found his feet: he isn’t at the end yet, but he knows he’ll get there, and by his own hand. The forces that work against him may have plans, but he won’t be subject to them. It’s the end credits, so to speak–the moment in a happy ending where the protagonist turns in self-assurance, and we’re faded happily to know that there’s no more suffering in this scripted life: where it goes from here is defined by the tone we’re left with, and it’s one of unbridled freedom. I have a strange relationship with progressive rock of the more niche varieties–or symphonic rock, or art rock, or whatever this may be, it reminds me of all–in that it sometimes makes me uncomfortable in its bombast. I feel like either it’s making me feel stupid for not getting it, or like it’s convinced I should feel stupid when it’s far more transparent than it thinks–over-reach in the extreme. I’m often unsure which it is, and prefer to take it, instead, as cause for enjoyment (if I am stricken with the desire to do so, which I am not always). This is, in the end, an enjoyable album–which is the majority of what matters to me. It’s constructed and arranged nicely, so that there’s never a feeling of a missed step. It does occasionally seem to have puffed out its chest, but the way Batt writes about the concept on the sleeve, it’s very humble and pleasant: there’s the immediate declaration that he isn’t writing anything profund or intellectual, just his own personal interpretations and understandings. It may well have been that attitude that rescued it, as I can have difficulty preventing my eyes from rolling at strong orchestral sections, no matter how well-performed they may be, in certain contexts. And, beyond that, there’s a disconnect for me in clean, clear, expert kinds of performance, the kind found almost exclusively in orchestral music. One of the first conversations I ever had with someone I had an very complementary relationship was about the differing in stances on the subject of music: overhead, we heard “Here Comes a Regular” by the Replacements, and I said “This, this is what music is to me,” and she disagreed: to her, precision and skill defined performance. A singer was good if they hit the notes properly, if they worked to present themselves within that framework–bringing emotion to those pre-set notes and stylings. On the other hand, I liked the rough and immediate emotional nature of a song sung by its writer–regardless of the quality of their voice–because it conveys most directly the feeling of that song. Tarot Suite manages to juggle the two of these: Blunstone, Chapman and the guitars (as well as some of the electronic peculiarities of Batt himself) brought my kind of humanity to the kind of music I often respect but cannot connect to, and kept it engaging as it went on. Not an extremely strong recommendation, but if the sensibilities of it sound appealing, on that grounds I will move the recommendation to a strong one. Next Up: The Beach Boys – ?